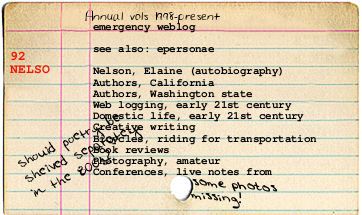 My name is Elaine Nelson; I’ve been keeping this site in one form or another since 1998. I currently live in Olympia, Washington USA. You can contact me through epersonae – at – gmail – dot – com. I write about my personal life, although there’s plenty that I leave out. I write occasionally about my professional life, but not about people, and of course nothing I say here should be expected to have any relationship to official policy of my employer, etc., etc., etc. I curse from time to time. Everything I write, and all the photographs that appear here, are copyright me. Except where they’re comments from somebody else, in which case everybody retains their own rights. Whee! This site is created using WordPress. The book reviews are fed by Goodreads.